The Global Alliance for Women�s Health (GAWH) was founded in 1994 by Dr. Elaine Wolfson. Dr. Wolfson�s experience as an NGO representative at the United Nations in the early 1990s, along with more than two decades of work on women�s health policy, made her highly aware of both the consistent under-attention given to women�s health and the inadequate information available on women�s health worldwide. GAWH was founded in an effort to address these shortcomings and to bring issues of women�s health to the forefront of global policy. Through advocacy, education, and promotion, GAWH has been making significant strides in the public and private arenas toward the advancement of women�s health throughout the world. Since our founding, GAWH has emphasized the importance of addressing issues of women�s health throughout the life span. Although efforts to advance women�s health were being made by NGOs and UN agencies during the 1990�s, they tended to focus exclusively upon maternal and reproductive health. While GAWH applauded these early steps, we noted that maternal and reproductive health represent particular stages of women�s health needs, and, in order to truly empower women worldwide, women�s health must be advanced in all stages of life. Thus, since the onset of our organization, we have worked passionately to incorporate all stages of women�s health needs into global policy agendas, especially those needs that fall beyond categories of maternal and reproductive health. In our initial years, GAWH was deeply involved in preparations for the 1995 UN Fourth World Conference on Women in Beijing. In an effort to give voice to NGOs, GAWH held numerous consultations in the form of caucuses and panels, with scores of participants from international and national organizations and agencies. The meetings generated a set of proposed actions and policies related to women�s health, which were subsequently articulated and compiled by GAWH into a publication entitled Women�s Health Compendium. The proposals cover a cross-section of women�s health concerns which are far-reaching, reflecting the depth and breadth of issues involved in women�s health. The Women�s Health Compendium was a crucial intervention. Not only did it bring to the table the growing concerns of NGOs, it also resulted in a much fuller array of women�s health issues in the Beijing Platform of Action. GAWH has since taken on a wide range of critical women�s health issues, primarily those that are ignored or under-attended by other NGO�s and UN agencies. In 2003, we launched a campaign to expedite treatment for women with HIV/AIDS in Sub-Saharan Africa. As part of the campaign, GAWH has held five roundtables at the UN in New York, Geneva and Addis Ababa; donated 36,000 patient treatments of Tibozole to Burkina Faso; and initiated a petition that supports equal treatment for women and men with HIV/AIDS, as well as calls for reports of the gender allocations of resources to be made public. Also in 2003, GAWH undertook a diabetes campaign to expand international awareness of the increasing prevalence of diabetes and its negative impact on women. (Since 2007, this campaign has focused primarily on the problem of diabetes in pregnancy.) As part of our campaign, GAWH has held nine symposia on diabetes, and submitted a statement (E/CN.6/2005/NGO/36) to the UN during the 49th Session of the Commission on the Status of Women (CSW) that underscored the need to both develop forward-looking policies as well as take on the epidemic from a gender perspective. Moreover, GAWH has initiated a network of worldwide NGOs to disseminate information on the diabetes epidemic. In 2007, GAWH began a campaign to prevent cervical cancer worldwide. 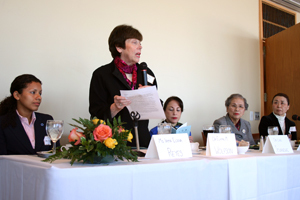 During the 51st CSW, GAWH organized and facilitated a working luncheon entitled �Preventing Cervical Cancer with HPV Vaccines,� in co-sponsorship with the Permanent Mission of the Niger to the UN and in partnership with GlaxoSmithKline Biologicals. The luncheon drew a large audience, which consisted of ninety-seven people from twenty-four countries, twenty-two NGOs and five UN organizations. GAWH has also initiated a worldwide network of individuals and organizations to disseminate information on cervical cancer and HPV vaccines. In addition to HIV/AIDS, diabetes, cervical cancer and HPV, GAWH has brought attention to several other women�s health issues. We have addressed trachoma, coronary heart disease, depression, smoking, as well as osteoporosis and osteoarthritis. Our organization has held seminars, roundtables, and briefings on these issues in most regions of the world. The prolific history of GAWH would not have been possible without our numerous partnerships and coalitions throughout the years. Since our founding, GAWH has strongly emphasized the importance of public/private partnerships, and through such collaborations we have successfully called attention to the need to advance women�s health throughout the world. With the aid of coalitions of international and national NGOs, women's groups, health care professionals, religious organizations, academics and individuals from across the globe, GAWH has continuously been a trail blazer in advancing women�s health worldwide. The Global Alliance for Women's Health (GAWH) is a non-governmental organization (NGO) in Special Consultative Status with the United Nations Economic and Social Council and is affiliated with the United Nations Department of Information. GAWH is a tax-exempt 501 (c) 3 not-for-profit corporation.